Anti CCSS Warriors, it is ‘Tech Thursday’, which means we take a look at the latest in Common Core beyond high school. 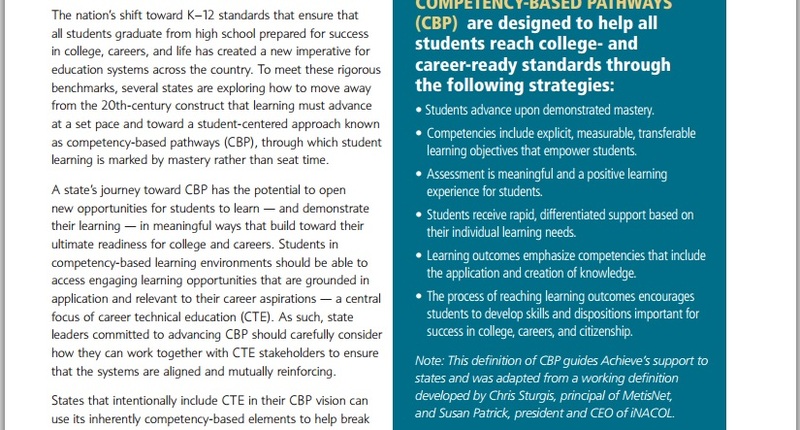 If you have followed my blog long, you know I have connected the dots between the Common Core and Career Tech Education (CTE). If you are new to the blog, then know that, yes, there is an ‘adult version’ of Common Core aka College, Career Readiness. CTE is embedded in the ESSA (Every Student Succeeds Act), the WIOA (Workforce Innovation and Opportunity Act of 2014), the STEM Act of 2015 (Science, Technology, Engineering, and Math), and the HEA of 2008 (Higher Education Act which will be re-authorized in the near future). In December 2015, just a few days after ESSA was signed into law the HEA received an extension so that CTE funding could continue on until the HEA is re-authorized. In the screen shot above, you may not be able to see the date this Tweet was shared, but it was May 3rd. You can plainly see Achieve, Inc. is the group which sent this out. Achieve, Inc. is a huge member organization in the CCSS Machine (Common Core State Standards Machine). Much research has been conducted and shared about this fact. You can easily find the information, here on my blog, and elsewhere. For the remainder of this article, I will be focusing on what is the latest CTE news. The partnership you should know about: Achieve, Inc. and Advance CTE. As with so many of the CCSS Machine organizations,they love to gather together and create these reports detailing their continued work in aligning education to workforce based learning, not academic prowess. This one appears to be proud of this fact. Shameless, isn’t it? 2) Thirty-four States have been championed as ‘leaders’ in this field. How? By providing career-readiness indicators. Of the 34, 32 have anywhere between 1-6 career-readiness measures. Of the 34, only 20 have a bonus point/reward system in place for career-readiness. In the screen shot below, SC is displayed as a leader in this indication system. Note the P3 (public private partnership) between education and business; the involvement of the SC Chamber of Commerce, and the use of WorkKeys; note the unabashed use of gold/silver/platinum in reference to people’s success. 5) In the Achieve, Inc./Advance CTE Report, page 7 will tell you the meta-indicators States are using. These will only increase as the ESSA implementation process marches on. In the following pages, be sure to look for the values placed on these, the denominators to be used in calculating rewards/bonuses. 6) Beginning on Page 11, the public data reporting is detailed. Then use the Appendices to learn the programs used. Warriors, as you can see, the education reform is not set aside for any ONE group of people. It is not exclusive to one educational choice, at present. As the ESSA, the WIOA, and the HEA are continued to be mandated, updated, and implemented in their full fashion, we will see choices in education reduced. We will see national and international adherence for workforce increased. What can we do? Inform those who need to know! Share this alignment agenda with those at the local level in education AND job creation. More than likely they only have the PRO side of the CCSS/CTE message. In our fight against Common Core, we’ve learned that it’s a lie to think CC is only for K-12. We’ve learned it’s before K and after 12th. 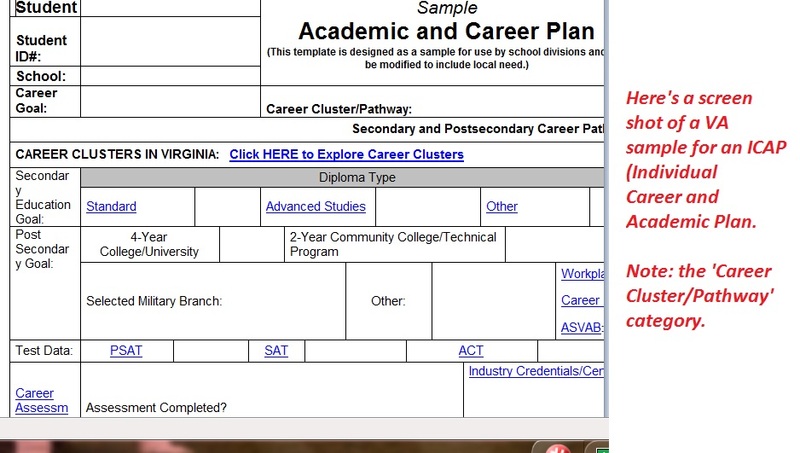 So, what IS the difference between a Career Cluster and a Career Pathway? They are both Common Core aligned. I often thought they were the same thing, just using difference names to throw the anti CCSS warriors a dud lead. Oh, but I think I’ve found out something new! Curious? I hope so! One of the many CP logos, this one is from the U.S. Dept. of Ed. Above is one of the official logos for Career Pathways, below is one of the many logos for Career Clusters. Both of these are from the U.S. Dept. of Education. However, each state will have it’s own logo. Look for the similarities between the national levels and state levels in logos when you search your state’s. So, is the U.S. Dept. of Education THE founder of Career Pathways/Clusters? Great question. As far as my research has been able to confirm, not only has the U.S. Government dreamed this up years ago, along the way it has had help from various outside sources as well. 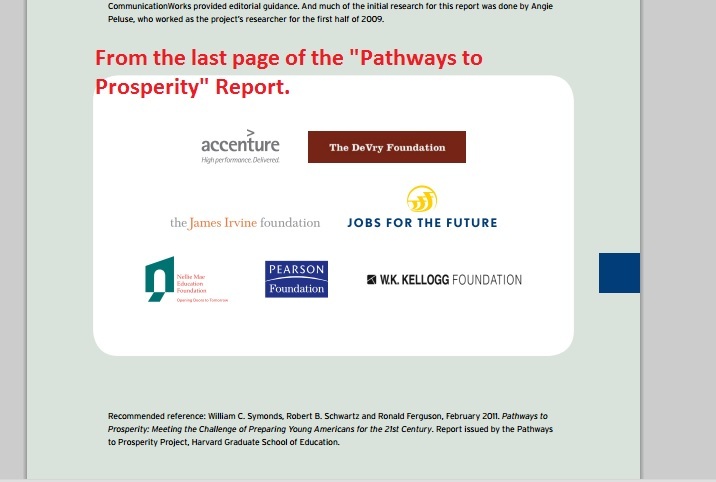 More recently, the joint project between Harvard University and Pearson Publishing (Pathways to Prosperity) catapulted the movement into high gear. But, don’t leave out the Association for Career Technical Education(ACTE) , or the National Association of State Directors for Career Technical Education Consortium(NASDCTEc). These groups have spent millions of dollars aligning curriculum, courses, and creating caucuses to ensure CCSS is carried over into the post-secondary world. So, what exactly is the difference? Here’s a great explanation I found on a website for MN’s Career Pathways. 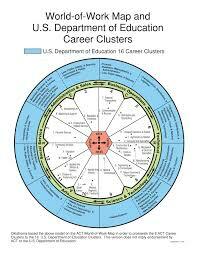 So When DID CCSS enter the Career Pathways/Clusters Business? Obviously, certain members of the CCSS Machine think aligning careers is cool. So, while we’ve learned that Career Clusters and Career Pathways are not the same thing, we also have learned how both are CCSS aligned. No career can truly be its best when it is aligned with standards, programs, curricula based on a lie. What a dreadful future we face. No future aligned to STEM (which, if you’ll remember was the main agenda years ago with CCSS as the delivery system, see my PCAST, STEM, and CCSS article from 2014) OR CCSS can help our students succeed or our nation be fantastic. I think careers are great, I think assessments, learning about the subjects are worthy. I just don’t believe we are best served by running all of these through the CCSS Machine. WYBI Wednesday: ICAPs, Common Core and More! Recently, one of my fellow anti-Common Core Warrior friends in Colorado shared with me (along with others on Facebook) about ICAPs and Colorado. Individual Career and Academic Plans combine not only Common Core Standards, but Workforce, College Career Readiness, Career Tech Education AND IEPs (for those with learning disabilities)! So, being who I am, I became curious…are there other states with ICAPs? Indeed there are! Let’s dig in, shall we? According to the report, there are many different names for the same agenda via Career Tech Education, Career Pathways, Common Core, and more. Questions in the ICAP are designed for students at the 7th grade levels, however, as I’ve found in researching college/career readiness and CCSS, we know plans start much earlier than 7th grade. For example, one set of questions asks the students about what talents they have. Another asks what they accomplish well. Then, there’s a question about which family member has an occupation you like. Questions for the 9th and 10th graders are great about selling the post secondary CCSS aligned courses at community colloges, dual enrollment, etc. Both groups are asked if they are aware of the Career Clusters/Pathways and what they do outside of school that enforces their possible career. (See the entire document: acp_template Oh, one more note, according to the state’s website, the template. *Note: MS and OH also have ICAPs; CA’s is called “Linked Learning”; NC’s is “Career and Technical Education”. The names will vary, the agenda won’t. According to the report there’s an urgent need to have college/career readiness. Why? Accountability purposes! To whom? To what? It appears to be the individual states labor markets! You’ll also find the same CCSS supportive groups are cited as reliable sources for things like ‘more rigor’, ‘global competitiveness’, and ‘closing the skills gap’. 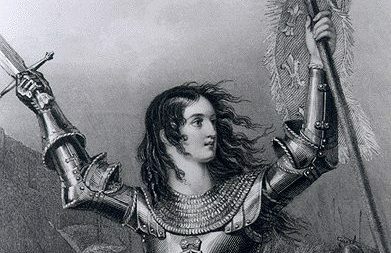 Who;s leading the charge in the community? It’s not so much the schools…it’s the businesses! Don’t look now, but special CTE leaders are being groomed. RMT: VP, Unions, Career Tech, and Common Core? Ahh..Sunday, our “Riddle Me This” day for all things Common Core. So, without fail, here’s your riddle of the day.. What do you get when you take the Vice President, add a couple of well financed union groups, provide a lunch in the meantime, AND talk Career Tech Education that just HAPPENS to be Common Core aligned?? You get the 2014 ATF/AFL-CIO Career Tech Education Summit! Career Tech Education aligned to Common Core..best bang for the buck?! Held just a few days ago, November 13th. All involved gathered at the AFL-CIO headquarters in Washington. 2) Remember there are several articles here on my blog about the ties between Common Core and Career Tech Education. The U.S. Secretary of Labor spoke as well. A You Tube video, almost 2 hours long is available, should you wish to find it. Sometime after 2006, when the Perkins Act was last updated (making it Perkins Act 4), this presentation was given by the NASDCTEc (National Association of State Directors of Career and Technical Education Consortium) Executive Director Kimberly Green, shares that the Perkins Act funding will reinforce Career Tech Education, Career Clusters; that such programs will be ‘rigorous’ and globally preparing each student; that academic and technical standards will be integrated; that education, workforce, and the economy will be united; stressing some sort of degree, credentials, or similar; the one of the best ways to accomplish all these are the 16 Career Clusters; that well known CCSS supportive groups are helping this effort (like College Board, the National Governors Assoc., etc. ); that curriculum alignment, standards alignment, and data collection are all part and parcel; finally, we all must change attitudes about CTE. When you have friends in strategic places, you can advance the agenda without attention! CTE’s website has a page devoted to its “Friends”. If you’ll remember, Snap-on Tools (above) is one. If you’ve already clicked on the link to see how they advance the agenda of CTE, good. If not, here it is. Their advancement of CTE is based off the belief that success is rooted in our workforce. This belief is expressed in a book written by a Harvard professor. As we’ve learned before, Harvard is knee deep in Common Core. Final riddle: Did you know there’s a caucus for this? This caucus comes complete with a ‘support fund’ where donations are used to help fund research, etc. (be sure to click on that tab) There’s also an upcoming “Career Tech Vision Conference” next week, Nov. 19th..if we hurry we can get to Nashville, TN to hear U.S. Dept. 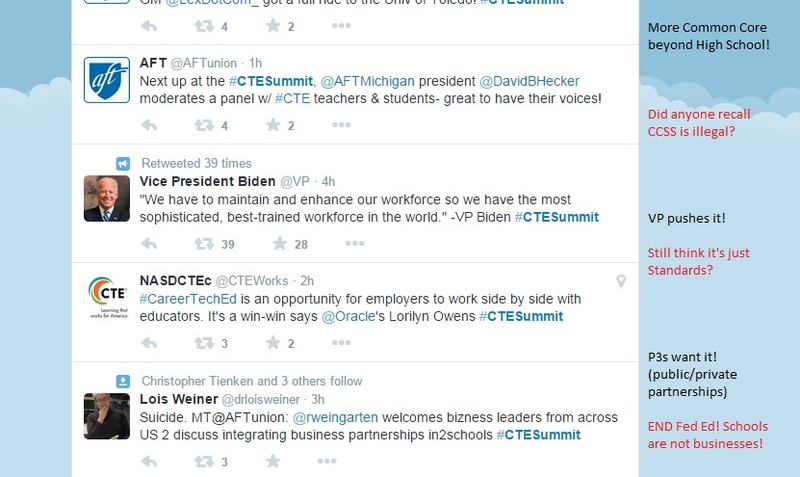 of Labor Secretary, Mr. Perez; Diane Ravitch and others promote CTE. Here’s the flyer: http://careertechvision.com/ If we get there in time for the pre-conference activities, we can get in on the Harvard/Pearson “Pathways to Prosperity” inspired construction career pathway. Even the U.S. Army will be there. Why, I bet, if we hurry we might even get a sneak peak at the Grand Ole Opry! 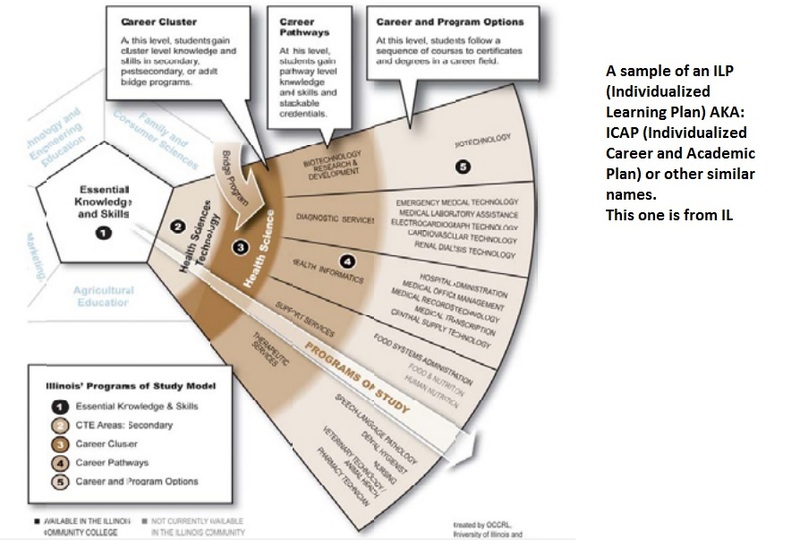 How interesting the ‘who’s who’ in CCSS, CTE, Career Pathways is becoming.